Pros: The glass screens last 5X longer than the metal. Pros: As always, "You guys are the FIRST place to Gogo" and Shipping is Outstanding! Pros: Excellent product! Absolutely amazing! A must have for all glass pipes or one hitters. Cons: Will fall out of a brand new pipe but place it in bowl, pack bowl and after first use it will no longer fall out! Can even tap pipe to empty ash and stays in. Pros: These things are great last a long time if you take care if them an i got more than i ordered great service an fast shipping i love this site! Comments: Better than metal any day of the week!! Pros: These little "stars" are the only kind of screen I'll use anymore, they don't burn and break down like metal screens and you aren't potentially inhaling hot, burning metal.they also fit in any piece, and last forever. Highly recommend. Cons: Some of the stars I received were somewhat malformed but it doesn't really matter that much. They work either way. Pros: I always prefer these screens. They aren't perfect but they work just fine. They are cute, a d if you order like 3 they typically send you about 4 or 5. Pros: Great little glass screens worked great for my mini binger. Comments: You can't go wrong with this purchase. A must have for glass bowls! 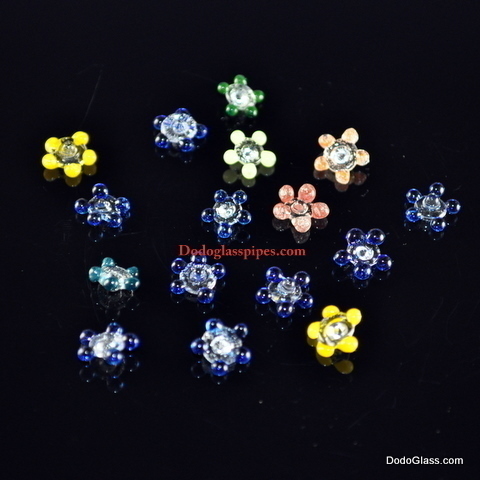 Pros: I prefer these Flower shapes over the other glass screens that gogo sells. These sit nice in my bowls, the resin let's them hold right in place, and I rarely ever lose one. I do have to clean my bowl or else the whole thing gets clogged. But I've used this one screen for over 2 months and haven't bothered to clean it yet and it's still fine. of you order 3, they will probably send you 5 or 6 screens. Good idea to keep a few on hand incase you do lose one. Pros: Love this bubbler! It hits like a bong and works like a charm. Buy it you won't regret it. Cons: Make sure to also order glass screens; they have it for a buck or two :) no cons! Pros: Work really well in a small hand pipe I bought. Fits nicely and keeps me from inhaling larger pieces of herbs. Pros: Much cleaner, a smoother smoke and easier to deal with than metal screens. Various sizes (though you can't choose), but not so much difference between the smallest and largest to be overly problematic if you use a single pipe. And the variety is a huge plus if you use in several difference pieces. Cons: Sizes do vary, so order a few if this might be an issue. Have also received a couple broken ones over the years, but really 2 out of 20+ I've ordered. Pros: Haven't had a hot chunk of ash hit me in the throat yet. Cons: Have to clean a little more often. Cons: Gets tarry quick, but thats gonna happen. Comments: The screen to have for those who avoid metal. Pros: Nice little Sherlock for the money. The low bowl design fits in the left hand well while the thumb controls the carb as the right hand runs the lighter. Cons: Though it does stand on its own it does wobble and teeter a bit, so care must be taken not to knock it over while it sits. Comments: Hits like a champ! Ordered some glass screens and they work great in this piece. Pros: Very pretty, and a nice idea. Cons: Don't work at all. Pros: This is a great product. Much better than metal screen. Pros: - durable - come in assortment of color - these daisy screens have a stem that goes down into the hole of the bowl to keep it in place. Cons: - these daisies have a stem that goes down into the hole of the bowl. Sometimes, it's a little cumbersome to handle such a small piece if you have big hands. Comments: I've listed the fact that these daisy screens have an approximate 1/2 inch stem in both pros and cons because they offer both. The stem can sometimes be difficult to get lined up into the bowl, epending on bowl size and shape. When using with my SB1471 slider bowl I got here, it frequently turns upside down and have to fish it out. It's not a big deal, but it can be annoying. Also, my fingers are always covered in ash and resin from having to handle and manage the screen. The daisy screens without stem are less messy. However, the stem keeps the daisy in place. Personally, I like the stemless daisies, but not enough for it to be a big issue. I felt it was worth mentioning so you can decide. Great item from a great store all around. Pros: Work good ordered 7recieved 11. Cons: Easy to accidentally toss. Pros: Perfect size, easy to clean. Gogo always sends extra. Pros: these glass screens are geat,i love them,i ordered 5 and received 11,wow great deal,thank you. Pros: Good for their use. I use it every time. Pros: I highly suggest getting one for every piece you own and some extra work great and are inexpensive. Comments: GoGoPipes always hooks it up and gives me 1 for free. Pros: They come in various sizes so you can use them in your pipes and bowls. Bought these to add to my ash catcher and it works great! Comments: Throwing in extra screens just makes me want to order more. Thanks gogopipes!! Pros: I ordered one and got two. Thanks! They fit perfect. Pros: Easy to clean, Reusable, Ordered 3, recieved 5 (THANKS! ), Inexpensive! Comments: I'm never going back to metal screens again. Pros: No ashes get through...Love them! Pros: fits in almost everything i own and works well. Pros: Works great no ash or herb gets through the bowl. I bought one and they gave me three which was cool and shipping was fast. Pros: Ordered 2 got 3 thanks gogopipes! Pros: I always buy these when I shop online here. They always send a couple of extras. Much better than metal screens. Cons: Only con is that they get lost easy. Pros: I love these little guys. I bought 1 and got 4 which was awesome. They really make a huge difference. I have a steamroller that never fails to get pieces of whatever i'm smoking in my mouth. But if i pop 1 of these guys in, problem solved. They're so easy to clean if you really wanted to. Cons: Incredibly small and easy to lose but i usually keep mine in my piece at all times even while i'm not using it. Pros: Love this little thing! Coolest screen I've ever seen! ordered one and got 2, Highly Recommended!!! Pros: it is very helpful doesnt get bud in the water or down in the pipe makes it easy to clean. Comments: very small easy to lose i recommend getting a couple of them. Pros: Received in 4 days, would've been 3 if I were paying attention. Ordered 3, got 4, and they work perfectly. They're a little smaller than they appear in the picture, but still work awesome, arrived clean,in a little baggie. Comments: gogopipes.com have the best prices on the net. i will shop no where else.